Earl E. Ferguson III, M.D. Artistry becomes reality with the most complete portfolio of cohesive gel breast implants. The right implant can provide the upper pole fullness and contouring needed based on the desired breast shape. The amount of upper pole fullness and contouring you need depends on available tissue. The amount of upper pole fullness and contouring an implant has depends on its cohesivity. No two women are alike—from the amount of tissue they have to their breast-shaping needs. Your artistic vision relies on your ability to shape the breasts. Make your vision a reality with Natrelle®. With the Natrelle® Cohesive Collection, you can shape your breasts based on their varying levels of available tissue coverage. All Natrelle INSPIRA® Breast Implants are designed for upper pole fullness. How well that fullness is maintained when held upright depends on the implant’s cohesivity. ***Based on implant performance testing. Clinical signiﬁcance has not been established. Take creative control with 3 levels of cohesivity. 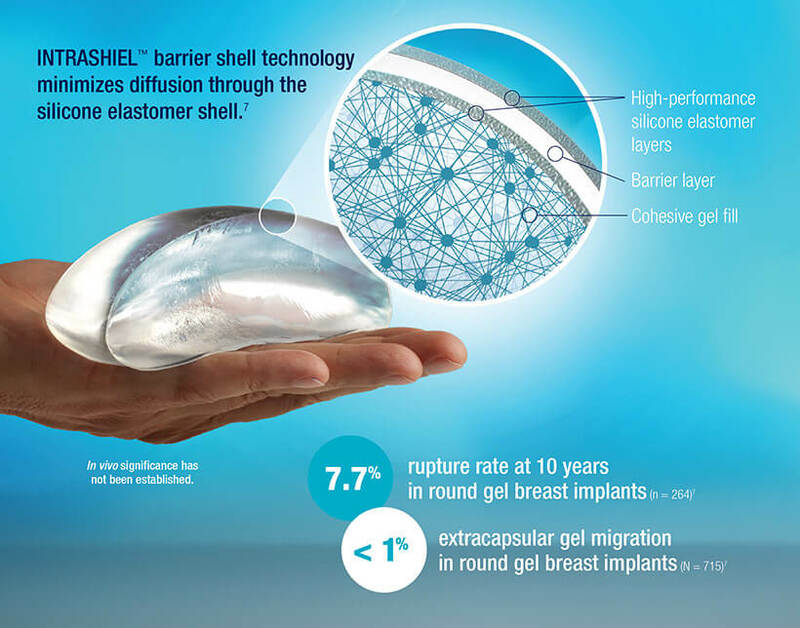 Cohesive gel in all Natrelle® Gel breast implants is designed to hold together. When Natrelle® Gel implants are cut ex vivo and compressed, the gel moves back into the shell. *Images for visual representation only. In vivo significance has not been established. *Implant selected: Natrelle ® 410 Style FF Implant dimensions: 475 cc volume, 13.5 cm base width, 14.0 cm height, 5.3 cm projection Photos provided by Dr Patricia McGuire. Individual results may vary. Now, the highly cohesive gel of Natrelle® 410 is available in a round gel. *Implant selected: Natrelle INSPIRA® Cohesive Style TCM-405 Implant dimensions: 405 cc volume, 13.25 cm diameter, 4.4 cm projection. Photos provided by Dr Alex N. Mesbahi. Individual results may vary. 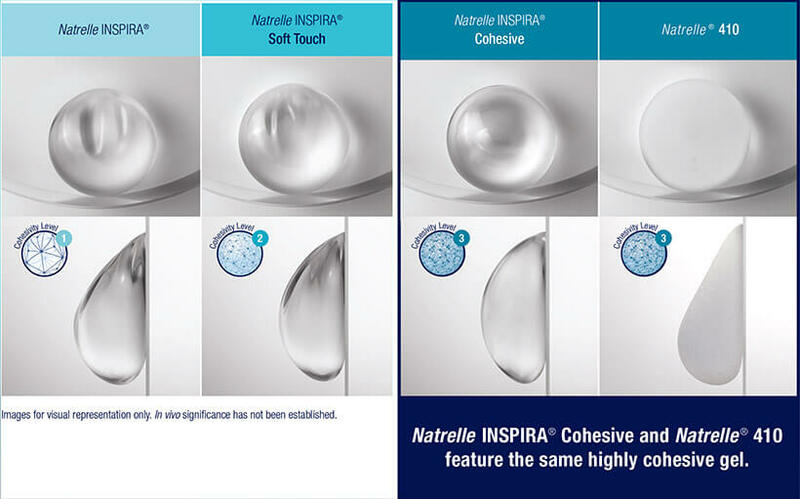 * Implant selected: Natrelle INSPIRA® Cohesive Style SCF-560. Implant dimensions: 560 cc volume, 13.50 cm diameter, 5.7 cm projection. Photos provided by Dr Mark L. Venturi. Individual results may vary. Implant selected: Natrelle ® 410 Style FM-395 Implant dimensions: 395 cc volume, 13.0 cm base width, 13.5 cm height, 4.8 cm projection Photos provided by Dr Bradley P. Bengtson. Individual results may vary. Implant selected: Natrelle INSPIRA® Cohesive Style SCM-310 Implant dimensions: 310 cc volume, 12.00 cm diameter, 4.0 cm projection Photos provided by Dr Allen Gabriel. Individual results may vary. Implant selected: Natrelle INSPIRA® Soft Touch Style TSM-345 Implant dimensions: 345 cc volume, 12.50 cm diameter, 4.2 cm projection Photos provided by Dr Charles Randquist. Individual results may vary. *Based on surgeon survey data, December 2016 (N = 100). †Based on US market share data through November 2016 (N = 67). From Allergan—the leader in medical aesthetics. Breast augmentation for women at least 22 years old for silicone-filled implants. Breast augmentation for women at least 18 years old for saline-filled implants. Breast augmentation includes primary breast augmentation to increase breast size, as well as revision surgery to correct or improve the result of a primary breast augmentation surgery. Treatment of soft tissue deformities. Who have an active infection or a residual gross tumor at the expansion site. Whose physiological condition (eg, sensitive over- or underlying anatomy, obesity, smoking, diabetes, autoimmune disease, hypertension, chronic lung or severe cardiovascular disease, or osteogenesis imperfecta) or use of certain drugs (including those that interfere with blood clotting or affect tissue viability) poses an unduly high risk of surgical and/or postoperative complications. DO NOT alter the tissue expander or use adulterated fill. Fill only with sterile saline for injection as described in INSTRUCTIONS FOR USE. DO NOT expose to contaminants. DO NOT expand if the pressure will compromise wound healing or vasculature of overlying tissue, or beyond patient or tissue tolerance. Stop filling immediately if tissue damage, wound dehiscence, abnormal skin pallor, erythema, edema, pain, or tenderness are observed. Active infection anywhere may increase risk of periprosthetic infection. Postoperative infections should be treated aggressively. Unresponsive or necrotizing infection may require premature removal. DO NOT use Natrelle ® 133Plus and 133 Tissue Expanders in patients who already have implanted devices that would be affected by a magnetic field (see Contraindications), because the MAGNA-SITE® integrated injection site contains a strong rare-earth, permanent magnet. Diagnostic testing with Magnetic Resonance Imaging (MRI) is contraindicated in patients with Natrelle ® 133Plus and 133 Tissue Expanders in place. Please see additional Natrelle ® 133Plus and 133 Tissue Expanders Important Safety Information on following pages. Natrelle ® 133Plus and 133 Tissue Expanders are temporary, single-use only devices, and are not to be used for permanent implantation or beyond 6 months. Tissue expansion in breast reconstruction typically requires 4 months to 6 months. When using suturing tabs be careful to avoid piercing the shell. Use a new one if damage occurs. Please see additional Natrelle ® 133Plus and 133 Tissue Expanders Important Safety Information on back. ADVERSE REACTIONS Deflation, tissue damage, infection, extrusion, hematoma/seroma, capsular contracture, premature explantation, displacement, effects on bone, pain, sensation, distortion, inadequate tissue flap, and inflammatory reaction. For more information, please visit www.allergan.com/labeling/usa.htm. To report a problem with Natrelle ®, please call Allergan at 1-800-433-8871. Natrelle ® 133Plus and 133 Tissue Expanders are available by prescription only. References: 1. Data on file, Allergan, January 2017; Allergan Plastic Surgery Order Form. 2. More of Everything: Natrelle ® Product Catalog. Irvine, CA: Allergan; 2015. 3. Our products: breast implants. Mentor Worldwide LLC website. http://www.mentorwwllc.com /global-us/Breast.aspx. Updated April 2016. Accessed February 13, 2017. 4. Sientra ® HSC & HSC+ Breast Implant Product Catalog. Santa Barbara, CA: Sientra, Inc., 2015. http://sientra.com/Content/pdfs/MDC-0177%20R2%20HSCHSC%2B%20Breast%20Implants%20Product%20Catalog.pdf. Accessed February 13, 2017. 5. Data on file, Allergan, February 8, 2017; Study Report MD16075-DV2. 6. Data on file, Allergan, February 3, 2017; Study Report MD16075-DV1. 7. Natrelle ® Silicone-Filled Breast Implants and Natrelle INSPIRA® Breast Implants: Smooth & BIOCELL® Texture Directions for Use, 2016. 8. Natrelle ® 410 Highly Cohesive Anatomically Shaped Silicone-Filled Breast Implants Directions for Use, 2014. 9. Data on file, Allergan, March 2016; Plastic Surgery A&Us: PLS and Patients. 10. Data on file, Allergan, December 2016; Plastic Surgery Monthly Tracker: Breast Implants & Tissue Expanders. 11. Data on file, Allergan, November 2016; Breast Implant + Tissue Expander Share Tracker. 12. Kline & Company, Inc. Professional Skin Care: US Market Analysis and Opportunities. Parsippany, NJ: Kline & Company, Inc.; January 19, 2017. 13. Data on file, Allergan, 2016; EAME Brand Share. 14. Data on file, Allergan, February 2016; US Neurotoxin Market Share Report.